A Johannesburg mall that offers "a food, fitness and shopping experience" has delivered somewhat less - one of its restaurants was flooded with sewage just hours before its official opening. Now, four years later, only five of The Core shopping centre's 25 shops in Sunninghill remain occupied, with some tenants claiming that they were duped into moving into the mall before a certificate of occupancy had been issued. Alfie Rebelo, who took out a loan against his home and threw his life's savings into opening a restaurant in the mall, said he had been ruined. He signed a lease with RFC Development for a shop in 2006 after he was told that the development would include a gym, a string of restaurants, and shops that would service an office block above the mall. He was told that about 6000 people passed through the mall each day. A Tshwane doctor has denied he used family members to benefit from several multimillion-rand Transport Education Training Authority (Teta) tenders. The doctor, who cannot be named because he has not been charged, denies that contracts awarded to his company by Teta, to train taxi drivers, during 2006 and 2007 to the tune of R10-million were "underhand". This comes after an investigation by IRS Forensic Investigations, commissioned by a disgruntled former associate of the doctor, found that "two members of Teta staff directly benefited" from the doctor's company receiving the contracts". The case has been handed to the Special Investigations Unit, which has passed it on to the Hawks. Parys - The day before a lawyer from Johannesburg presumably drowned on a game farm at Parys, he reportedly called in the services of a private detective. Greg Wynne, 43, had a strong suspicion that someone wanted to kill him, Chad Thomas, chief executive of Integrated Risk Solutions, told Volksblad on Sunday. Thomas confirmed that Wynne had employed at least one security guard after he started fearing his life was in danger. Chad Thomas, lead investigator of private financial crimes investigation company IRS Forensic Investigations today announced the launch of a new fraud fighting website www.irsa.co.za. Said Chad Thomas at the launch: "It is time to name and shame fraudsters and for all parties with a vested interest in combatting fraud to work together to ensure effective prosecution". The new website aims to upload progress reports of fraud investigations as well as naming and shaming convicted fraudsters. The website will also warn consumers of new scams. A Soweto man has complained to the police about PTH Construction Group and its directors, accusing them of using him as a front which enabled them to benefit from BEE contracts worth at least R100-million. Calvin Sithole, 47, was left jobless 18 months ago after the company - of which he was a director and shareholder in name only - went into voluntary liquidation. Profits which the company made and which were due to him, also vanished. Sithole, who began as a labourer in 1990, worked his way up to the position of administration manager in 2002. He was responsible for dealing with sub-contractors on various projects for which he was paid R15000 a month. Three years later, the married father of three was told by one of the company’s directors that they “wanted to reward my loyalty and make me their BEE partner”. Sithole, who laid charges of fraud at the Norwood police station yesterday, said he received director’s fees of R5000 twice, but that was all. He was excluded from the company decisions. Sithole’s case came to light after an investigation into 32 companies exposed suspected fraud by two of PTH’s directors, whose names are known to The Times, as well as Jan van der Merwe, its non-executive director and legal advisor. Private investigations firm, IRS Forensic Investigations, recently uncovered suspicious activities involving the same directors in a number of other company liquidations. IRS head Chad Thomas was hired by a number of creditors owed at least R20-million. Thomas said he found that the directors had transferred assets belonging to the company into trusts before liquidating it. 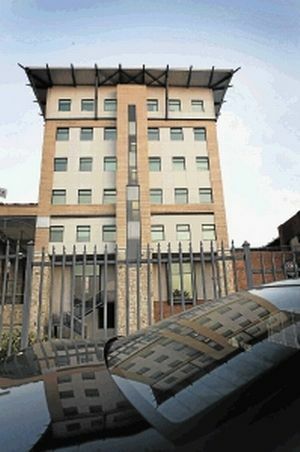 On the strength of their allegedly bogus BEE credentials, PTH were awarded two major contracts in 2006 and 2007 — a Pretoria office park and a Absa home loans call centre — worth a combined R100-million. After PTH was liquidated, Zycon Construction was formed with the some of the same directors and much of PTH’s equipment. Last February, Zycon was also liquidated. A 417 enquiry into the affairs of PTH and Zycon began yesterday. However, it is being managed by a law firm linked to Van der Merwe who denied any conflict of interest. He said he was merely helping the Master of the Johannesburg High Court.